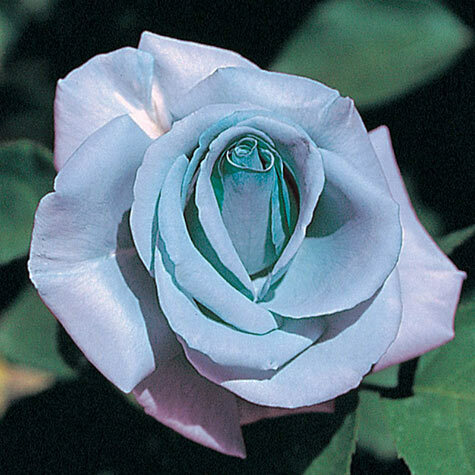 Blue Girl Hybrid Tea Rose | Gurney's Seed & Nursery Co. Fully double flowers with 35 to 40 petals—all a rare shade of lavender-blue. Just 2-3 ft. tall. Selection Tip: All climbers and hybrid teas are 2-year plants. No. 1 to 1 1/2 grade. Spacing: 3 - 4 feet. 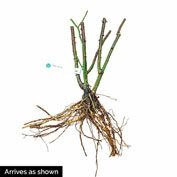 Depth: Dig a hole large enough to spread out the roots without bending them, firm well and water in thoroughly. Spread: 2 - 2.5 feet. Foliage: Dark green, leathery glossy foliage. Zone: 4 - 10 (-20 F.). 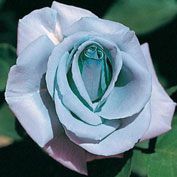 Form: Bush, classic Hybrid Tea Rose. Flower Form: Fully double, 5 inch flowers. Fragrant. Soil Requirements: Highly organic, well-drained, slightly acidic soil. Pruning: Prune spent flowers for repeat blooming. Size: 4 - 5 inch blossoms. Comments: If heavy soil, add peat moss, dehydrated cow manure or compost. Mound soil in center of hole, spread roots over mound, add 1/2 inch of soil; compact; complete filling; compact soil; water well. Fertilize once a month with rose food. Water 1 inch per week when rainfall is insufficient; remove spent blossoms, weak growth and suckers Spray or dust every week for insects. Mulch heavily around the base for Winter and cover rest of plant with straw or shredded leaves. Restricted States: AE, AK, GU, HI, PR.